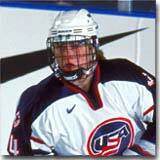 A three-time member gold medalist with the U.S. Women's World Championship team ('05, 08 and '09), Angela Ruggiero was one of the premier defencemen in women's hockey history. 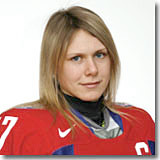 With her explosive speed and excellent agility, Ruggerio was named the World Championships' top defenceman four times ('00, '04, '05 and '08). She helped the U.S capture gold at the 1998 Olympic Games in Nagano, plus silver medals at the 2002 Games in Salt Lake City and 2010 Games in Vancouver as well as bronze in Torino 2006. Possessing one of the strongest and most accurate shots in women's hockey, Ruggerio was an invaluable player on special teams at Harvard University capturing the Patty Kazmaier Memorial Award in her senior year as the top intercollegiate player in women's hockey in 2004. In 2015, Ruggiero became the fourth woman to be inducted into the Hockey Hall of Fame. Goaltender Florence Schelling joined the Swiss national team in 2005. 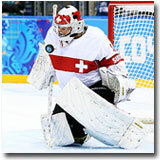 At the 2006 Olympic Games, Schelling was among the tournament's top goaltenders, posting an impressive .939 save percentage and 2.40 goals against average, leading the Swiss to a seventh place finish. Four years later in Vancouver, Schelling's strong play would help Switzerland to a fifth place finish. At the 2014 Olympic Winter games in Sochi, Russia, Schelling would guide the Swiss team to a bronze medal. She made an astounding 252 saves during the tournament and was named Most Valuable Player, Best Goalkeeper, and included on the All-Star Team. Sami Jo Small grew up in St. Vital, Manitoba, where, at the age of five, her hockey career began in 1981. But it wasn't until she started attending Stanford University on a track & field scholarship that Sami Jo discovered how deep her passion for hockey ran. Sami Jo was the starting netminder for Stanford's men's team for five years while she completed her degree in mechanical engineering. In 1998, Small was part of Team Canada at the Winter Games in Nagano, Japan. 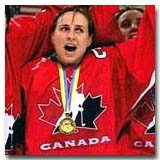 In 1999 and 2000, Sami Jo was selected MVP as Team Canada won the World Championship both years. The outstanding goaltender was part of Team Canada's Olympic gold medal effort in Salt Lake City in 2002 and again in Turin in 2006. At the Women's World Championships in 2004, Sami Jo was a gold medal-winning member of Team Canada, who earned their eighth consecutive championship. Yekaterina Smolentseva was born on September 15, 1981 and was part of the Russian Olympic team at the 2006 Turin Games. She has since become the offensive catalyst of the national team, leading the squad in points at each of the past three World Championships (2007, '08 and '09), including an impressive six points in just three games in 2009. At the 2010 Olympic Winter Games held in Vancouver, British Columbia, Smolentseva was part of the Russian squad that struggled to a disappointing sixth place finish. In 2014, at the Olympic Winter Games held in her home country of Russia, Smolentseva would score two goals and add four assists, helping Russia to a second consecutive sixth place finish. Born in Scarborough, Ontario, Natalie Spooner, helped Canada to the gold medal at the 2014 Olympic games in Sochi, Russia. In five tournament games she scored twice and added a pair of assists. She also represented Canada several times at the IIHF Women's World Championship including a gold medal performance in 2012. In 2014, Spooner led the Toronto Furies in playoff scoring as the club captured the Clarkson Cup as CWHL champions. 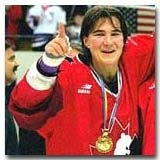 The oldest player on Canada's women's team at the 1998 Nagano Olympics, 39-year-old France St. Louis was a veteran of Canada's Women's World Championship teams from 1990 to 1999. She was the top scorer in the Quebec Senior Hockey League as a 38-year-old in 1996-97, but was noted as an outstanding defensive centre who excelled at winning face-offs. She was Quebec's Athlete of the Decade (1980s) in hockey and lacrosse and the Athlete of the Year in 1986. She retired shortly after the 1998 Olympic Games in Nagano as one of the most experienced and decorated of all Canadian hockey players internationally. An Olympic gold medalist in '02, '06 and '12, silver medalist in '98 and five time World Champion in '99, '00, '01, '04, and 07. Canada's Kim St. Pierre has proven time and time again that she is one of the premier goaltenders in women's hockey. The Top Goaltender at the '01 and '04 World Championships, St. Pierre was also named the Top Goaltender at the 2002 Winter Olympics in Salt Lake City. 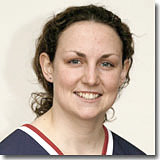 Kim played five years at McGill University and became the first woman in McGill history to play for a men's varsity team in a pre-season game and the first woman in CIS history to be credited with a win in a men's regular season game when McGill defeated Ryerson 5-2 on November 15, 2003. 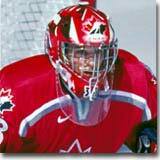 In 1998, St. Pierre broke the Team Canada record of 22 wins set by Manon Rheaume. At the 2010 Olympic Winter Games on home soil in Vancouver, British Columbia, St. Pierre again helped to backstop the Canadian team to a gold medal-victory. Vicky Sunohara was a star player at Northeastern University who represented Canada at the first official Women's World Championship in 1990, collecting six goals and three assists in five games. She did not play with the national team again until 1997. Sunohara would go on to capture six gold medals at IIHF World Women's Championships (1997, 1999, 2000, 2001, 2004 and 2007). She also represented her homeland at the Olympics, capturing a silver and two Olympic gold medals in her three appearances. Vicky ranks among the all-time leaders in career points at the World Championships and Olympic Winter Games. Goaltender Shannon Szabados made her Olympic debut on home soil in Vancouver in 2010. She recorded two shut outs while helping Canada to the gold medal. Four years later she again backstopped Canada to gold in Sochi, Russia. At the PyeongChang games in 2018 Szabados was named Best Goaltender by the tournament directorate, though Canada ultimately fell to the United States in a shootout in the gold medal game. In 2014 Szabados signed with the Columbus Cottonmouths of the Southern Professional Hockey League, becoming the first female player in SPHL history. Jessie Vetter was born on December 19, 1985 in Cottage Grove, Wisconsin. A standout goaltender at the University of Wisconsin, she received the Patty Kazmaier Award in 2009, awarded to the best female collegiate hockey player in addition to backstopping the champion American squad at the World Championship that same year. On route to the gold medal, Vetter was amongst the tournament leaders in both goals against average and save percentage, allowing just a single goal. Vetter was also the starting goalkeeper for the American's 2008 World Championship victory. At the 2010 Olympic Winter Games held in Vancouver, British Columbia, Vetter backstopped the American team to a silver medal performance. 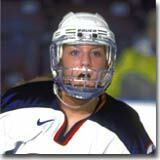 An offensively gifted player, Krissy Wendell retired as the second all-time leader in points for an American at the World Championships with 59. She made her debut with the U.S. National Team at the Three Nations Cup in 1998, and went on to capture four silver medals and one gold medal at the Worlds. She led the tournament in scoring on two occassions (2000 and 2005). In 1998, Wendell helped the U.S capture the first ever gold medal in Women's Olympic competition in Nagano, Japan. Krissie won the 2005 Patty Kazmeier Award, presented to the top US women's college hockey player, as a member of the University of Minnesota. Prior to her stellar international hockey career, Wendell was the first girl starter in the Little League World Series in Williamsport, Pennsylvania in 1994. A physically dominant player whose skills constantly revolutionized the women's game, Hayley Wickenheiser is one of hockey's greatest all-time players. 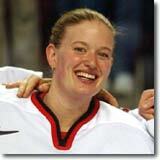 At the 2002 Olympics she led the Canadians to the gold medal and shared the event's scoring crown with 10 points. She duplicated that feat four years later in Torino, recording 17 points in five games and earned tournament Most Valuable Player honours for her effort. In 2010, Wickenheiser would captain the Olympic gold medal-winning Canadian team that emerged victorious on home soil in Vancouver. She would add a fourth Olympic gold to her collection in 2014 and received the additional honour of being chosen as the opening ceremonies flag-bearer and led the Canadian contingent into the stadium. Wickenheiser retired as the leading scorer in both World Championship and Olympic competition. A veteran of Canada's Women's World Championship-winning teams of 1990, '92, '94 and '97, Stacy Wilson was the epitome of leadership and inspiration both on and off the ice throughout the 1990s. In the 1997 National Championship, Wilson had a medal she received as a game MVP cut into 20 pieces and distributed amongst her teammates. 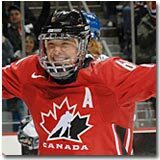 Her five assists at the 1998 Olympic Winter Games ranked her second on the Canadian team behind Hayley Wickenheiser and tied her for second overall in the tournament.